Nissan and 4R Energy Corporation today announced that the two companies have developed a charging system for electric vehicles that combines a solar power generation system with high-capacity lithium-ion batteries. 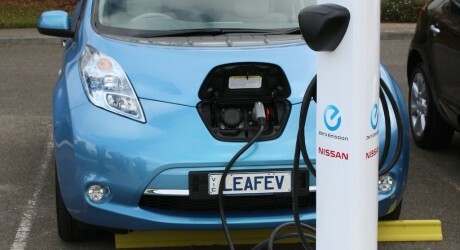 Testing of this new charging system began today at Nissan's Global Headquarters in Yokohama. With the new charging system, electricity is generated through solar cells installed at Nissan's Global Headquarters, and is stored in lithium-ion batteries which are equivalent to four units of Nissan LEAFs. With seven charging stations (three quick charge, four normal charge) located in the headquarter grounds, the total electricity that can be generated and stored is the equivalent to fully charging approximately 1,800 Nissan LEAFs annually. This new system will enable electric vehicles, which do not emit any CO2 when driven, to be charged through a completely renewable energy source. This is one solution to create a cycle where CO2 emissions resulting from driving is zero. By using the same lithium-ion batteries in electric vehicles as stationary storage batteries, electricity can also be supplied to EVs regardless of the time of day or weather, enabling efficient use of renewable energy sources. 4R Energy Corporation, a joint venture established by Nissan and Sumitomo Corporation in September 2010, has already started tests on a compact electricity storage system installed with second-life lithium ion batteries previously used in Nissan LEAFs. Based on the outcome of this larger system, 4R Energy plans to enter the market of mid-sized electricity storage systems for commercial and public facilities. Nissan and 4R Energy Corporation will continue various efforts to help move toward a sustainable, zero-emission society.